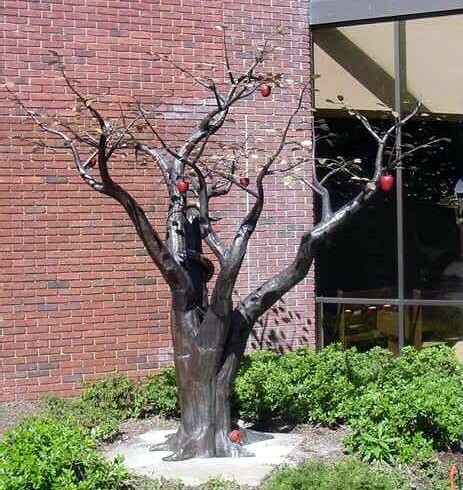 I was commissioned by St Thomas More Catholic Parish in Troy, MI to make the “Tree of Knowledge”. 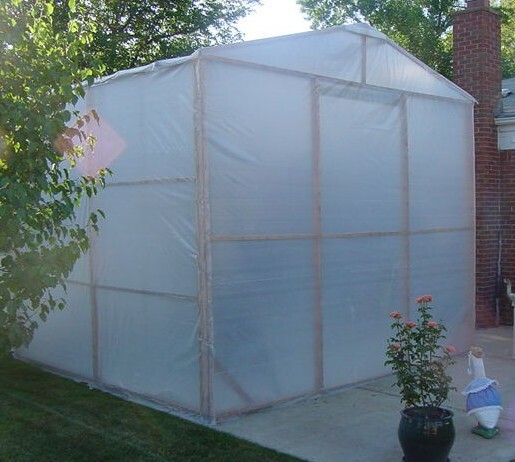 The tree is 10′ high and 9 1/2′ in diameter. The process of making the tree is documented in the gallery, in the order of completion. 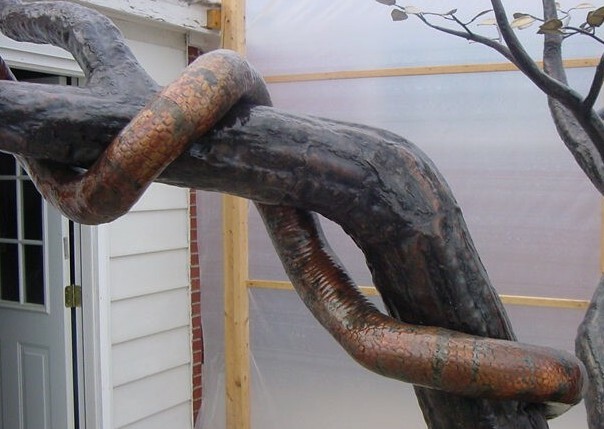 The first layer of copper sections welded to start the trunk. It is sitting on 1/8″ copper sheet, which will be cut and welded to the bottom. Holes will be drilled for the mounting. I am using phos copper rod for the welding. Building up the trunk of the tree and starting to add the branches. Starting to make more of the base of the branches. 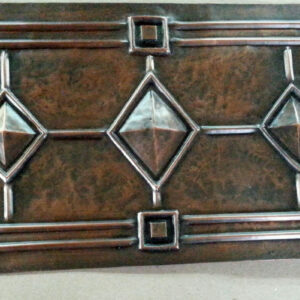 I have now switched over to 1/16 inch thick copper sheet. Forming the branches in section and added a bark-like texture by hammering. The snake needed to be quite large. This is a template laid out on the branches to get a feel of how large to make it. 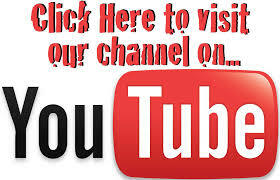 The snake is over eight feet long and about three inches wide. 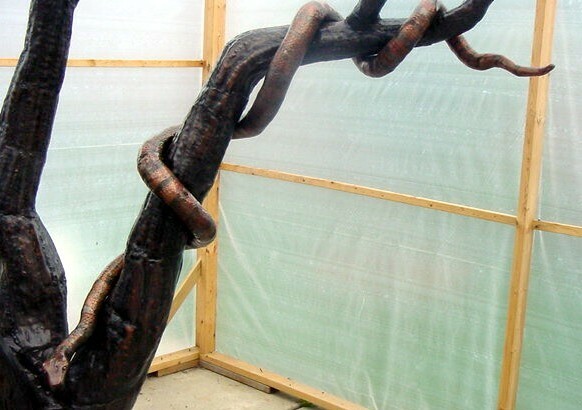 Because of the size the snake had to be made in sections, in order to fit on the branch. These are a couple of the sections after being welded. Due to the curvature of the snake, it was difficult to make in large sections. In order to create more colors I made small sections where a layer of phos copper rod could be added, to later add a unique patina. The tail section has been completed, now moving on the second section. The tail section has been completed, now moving on the second section. Before the snake was textured it was sanded. 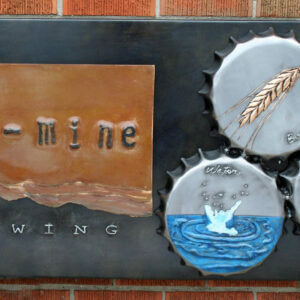 The phos copper was left to be in the gray state to add color to the snake. 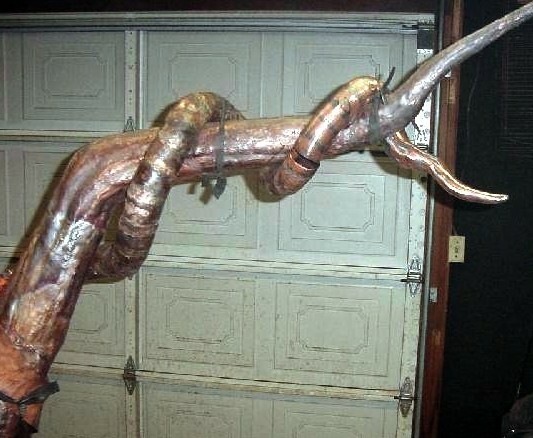 The snake’s head after welding. The rubber straps were used to hold the sections of snake in position for fitting. 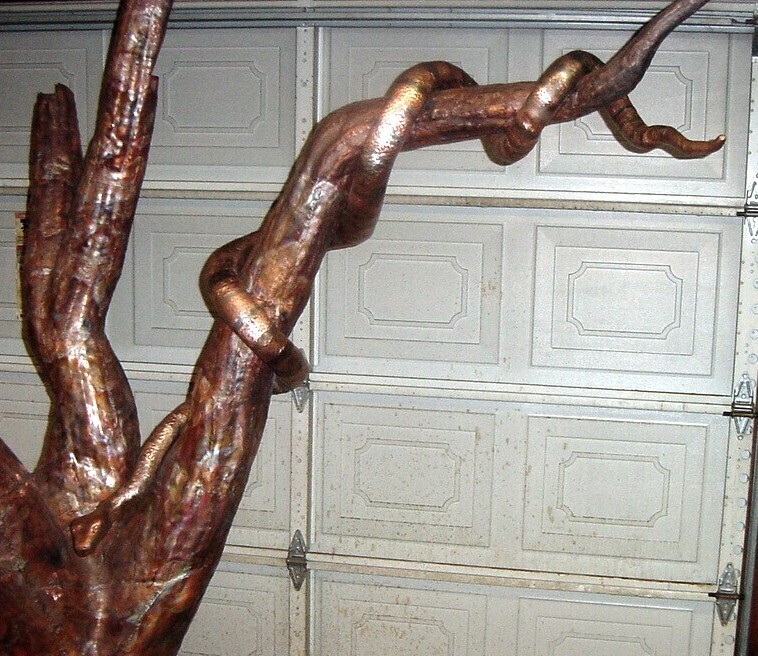 In order to make the snake’s texture it needed to be filled with wax. Normally pitch would be used but because of the size of the snake it was easier to use wax. Lots of wax. After the snake sections were filled with wax I added the texture. I created a punch specifically to hammer in the scale texture. 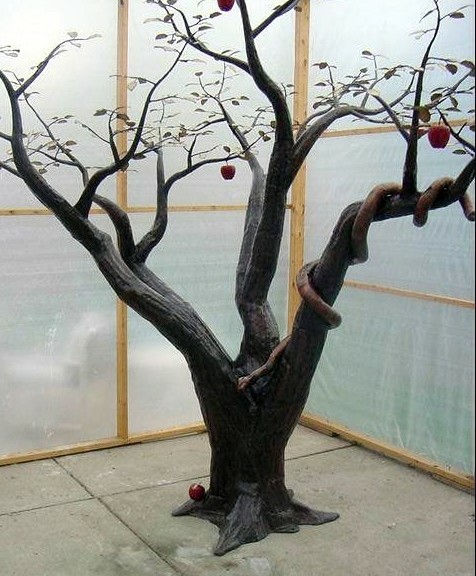 The snake is finally welded together and textured This is the apple that I came up with for mounting at the base of the tree. Had to have a bite removed. 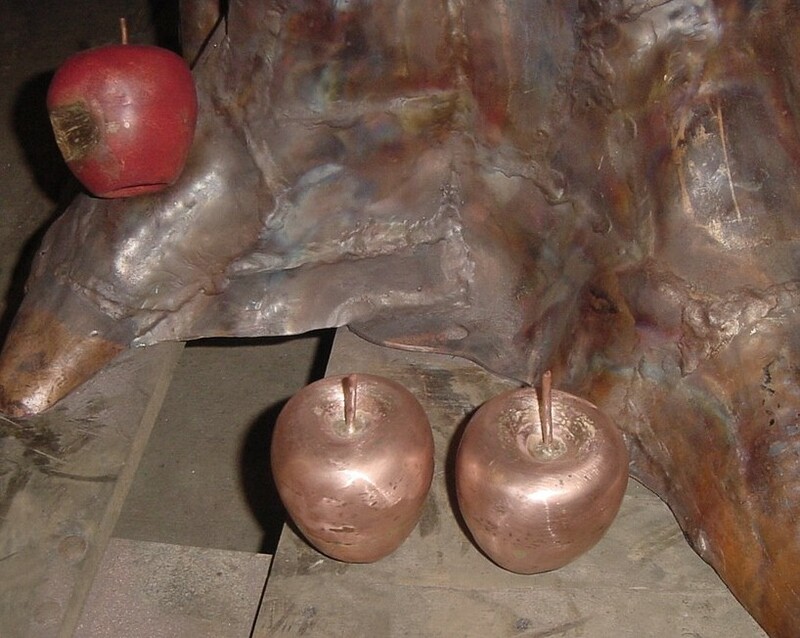 The apple was made in two halves by raising. 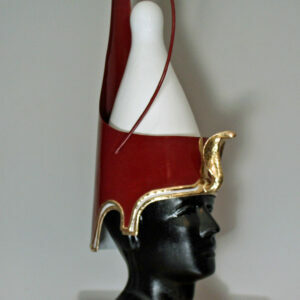 A red patina was added. 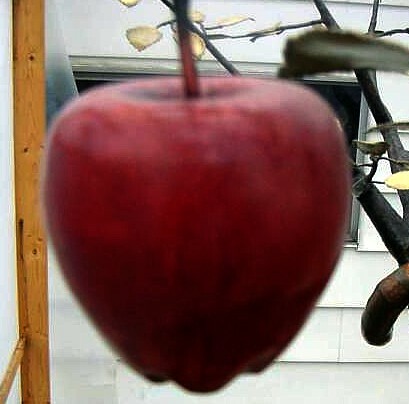 I made six apples for the tree. Each was raised in two halves, then brazed together. 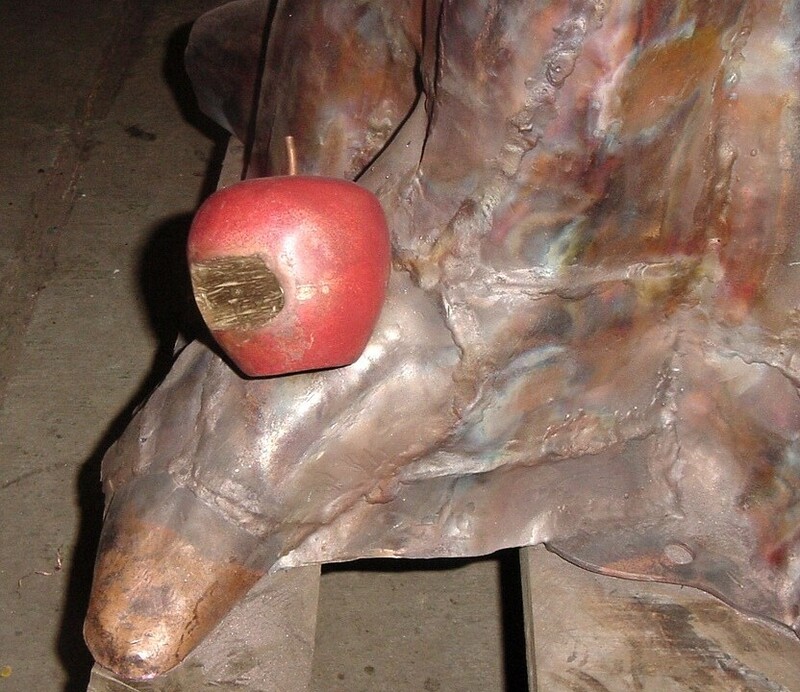 Brazing was used because if I had soldered them, the low temp of the phos copper would have caused the apples to come apart when adding the stems. The apples that were raised. 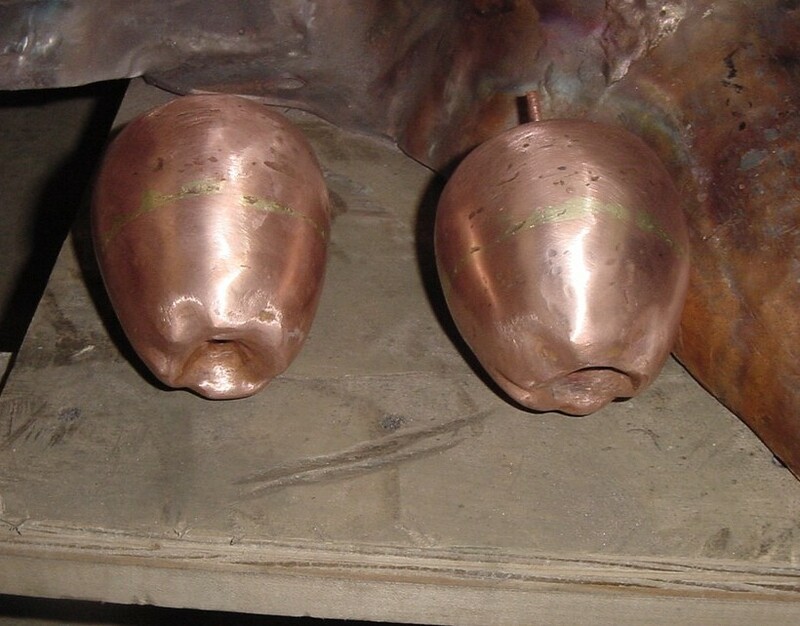 32 ounce copper was used. Since my shop ceiling is only eight-foot-high I made a temp shop. Little bit of 2X4s and plastic. Worked very well. The finished tree. I do not have pictures of adding all the small branches and leaves. The temp shop wasn’t very good for taking pictures. I lost track of how many leaves were made from brass. Likely around 300. All of the leaves were cut out of the .040″ brass with a torch. 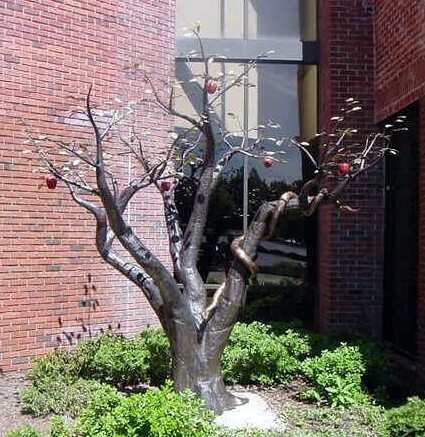 The smaller branches were made from 32 ounce copper. 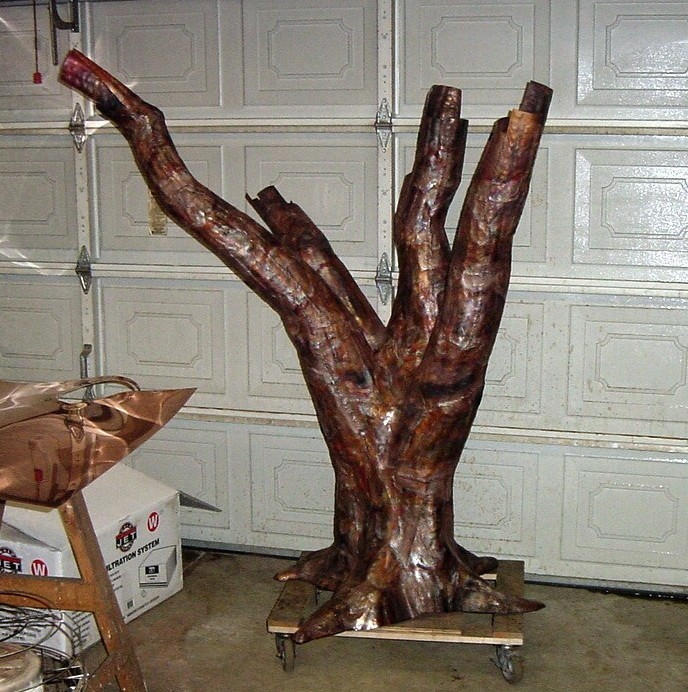 The tree patina was created with liver of sulfur. 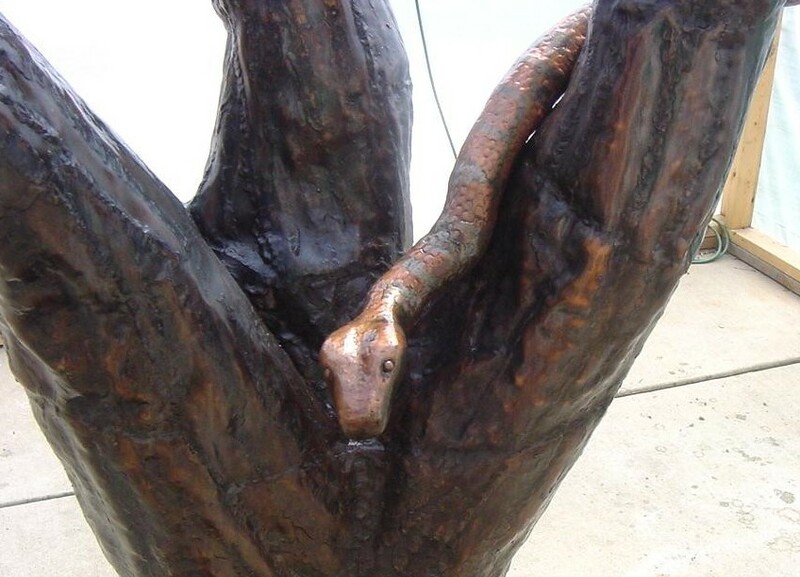 Close up view of the texture of the snake. Not only did I make a scale-like texture for it’s back, but also did a different texture for the belly. 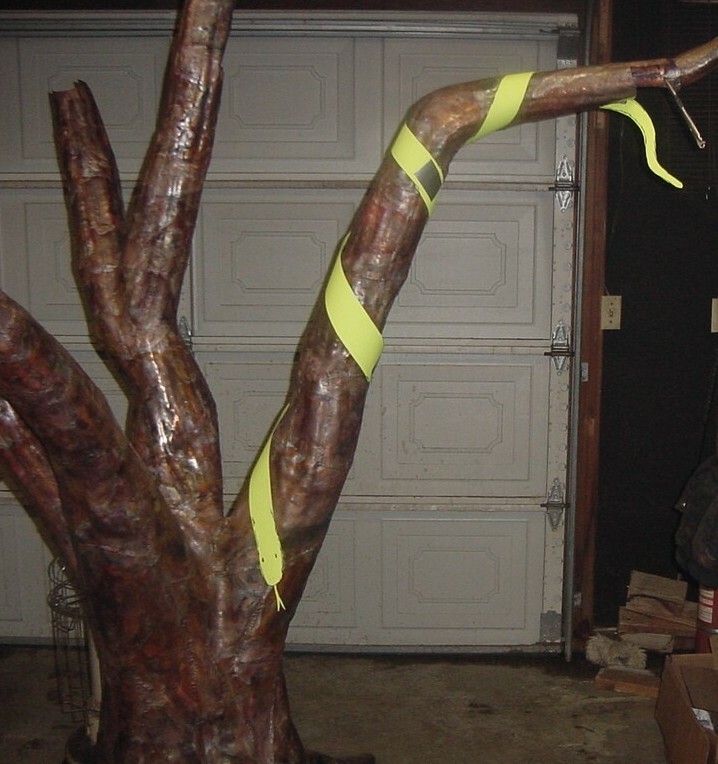 The snake and tree have been sprayed with a clear lacquer. In this photo, it’s still shiny from the lacquer. Two coats of wax will be applied, creating a matte finish. 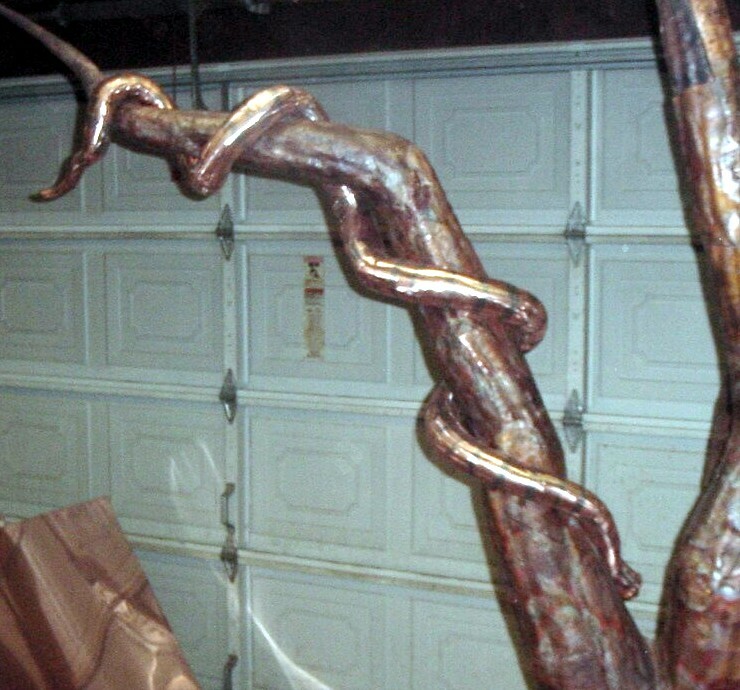 Here is the snake after completing the patina process and spraying with lacquer, then coating with two coats of wax. 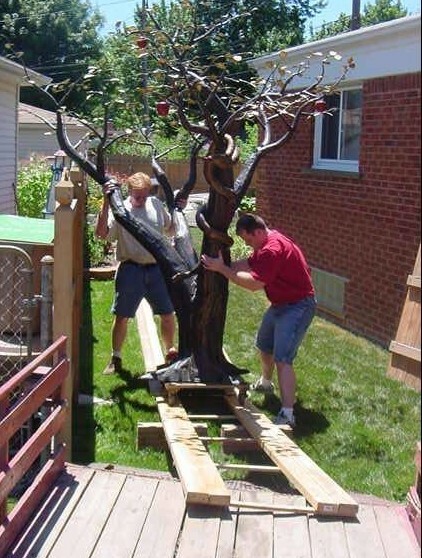 Moving the tree down the track into the trailer for transport. I had to make a track to move the tree. It weighed around 800 lbs. The tree in place but not bolted down. It needs to be turned so the snake is visible from the window.